Interesting Western Artifact Grouping includes; Concealed Boot knife, O/A 8”, includes 4-1/2” blade, Mother of Pearl Handle, copper wrapped for 1-1/2”, and marked NON•XLL Joseph Allen Sons Sheffield, England. nd c1890. ... plus, Dixon Cutlery 2 Blade Pocket Knife 4-1/2” with both blades open, decorated with mother of pearl panels, VG. 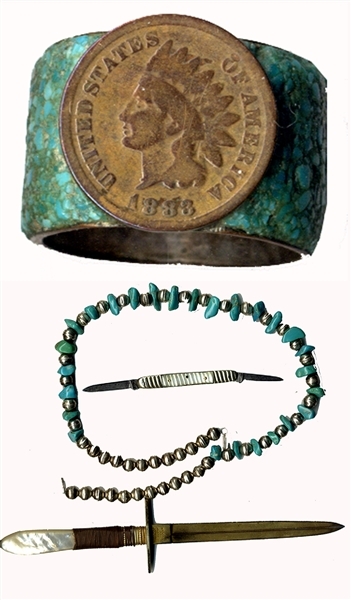 ... Men’s Decorated Indian Head Penny, 1883, mounted to silver clad copper, and decorated with turquois chips, VG. ... plus, Turquoise Necklace, 19” with 26 small chunks of turquoise strung between silver color beads, VG. The founder of the company was Joseph Allen who worked as a razor smith in New Edward Street(1861) and a "razor back forger" in Rockingham Street(1871). By 1881, he was living in Solly Street and employing ten men Allen built a reputation for his hollow ground blades. In 1883, Joseph Allen & Sons acquired the "NON-XLL" mark from Unwin & Rodgers, which he stamped on the razors and other cutlery.